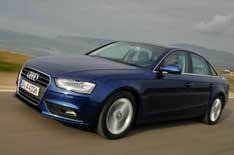 Audi A4 review | What Car? What is it? This is the latest version of the Audi A4, and it arrives at a crucial time for Audi, hot on the heels of the all-new BMW 3 Series. Unlike the BMW, though, the Audi isnt an all-new car. Instead, its been face-lifted outside, as well as benefiting from new infotainment systems and trims inside, and a range of more economical engines. Here, were concentrating on the saloon, but the changes apply to every A4, including the Avant estate, S4 performance car and A4 Allroad soft-roader. Whats it like to drive? Sadly, the revised A4 is far too much like the previous car on the road. We drove four versions of the car with 1.8- and 2.0-litre TFSI petrol engines, as well as the 2.0-litre TDIe and 3.0 TDI quattro. All suffered from a disappointingly firm ride and a rubbery feel to the steering. Although every model had plenty of grip and cornered securely, the poor feel through the steering meant it was less enjoyable to drive than the new BMW 3 Series. Unlike the BMW, the Audi doesn't flow through a series of bends with same degree of panache: it simply isnt as sporty. Instead, the A4s forte is more as a refined cruiser a job it does very well. With engine noise fading away into the background at motorway speeds, it flies along in decent refinement, with only some wind noise around the mirrors to spoil the calm. Of the engines we drove, the diesels suited the car best. Their low-down torque made for the kind of easy performance that the A4 thrives on. By contrast, the petrol engines needed working harder and, when they were revved, they became noisy. Whats it like inside? Again, the new A4 is very much like the old one, but thats no bad thing. Up front, theres plenty of room for the driver, with a good range of adjustment for the seat and steering wheel. Whats more, most of what has changed a revised MMI system, new steering wheels and new materials and trims improves the car. The MMI system, in particular, is now much simpler to use. That said, there are still some less high-quality materials on display in a few too many places; around the gear lever, for instance, and down by your calves. In the back, too, the Audi feels a little more cramped than the new 3 Series. Yes, it will take four adults, but theyll be more comfortable in the BMW. Should I buy one? The latest A4s combination of sharp styling, high quality and decent prices makes a compelling case, while it also has some features that its rivals dont. Model for model, it generally undercuts the equivalent 3 Series, too, meaning lower company car tax bills. However, our valuation experts predict that the BMW will have stronger residual values, which means the Audi costs more to own for private buyers and business users alike. Our initial impression is also that the Audi is second best to the 3 Series on the road, although well reserve our final judgement until weve driven the cars back to back in the UK. Take all that together, and the result is that we still favour the BMW.